(i) Sensitiveness (ii) Stability (iii) isochronism (iv) Coefficient of in-sensitiveness. (5 marks) 1(e) What do you understand by dry clutch and wet clutch? (5 marks) 2(a) A single plate clutch, effective on both sides, is required to transmit 25 kW at 3000 rpm. Determine the outer and inner radii of frictional surface if the coefficient of friction is 0.255, the ratio of radii is 1.25 and maximum pressure is not to exceed 0.1 × 106 N/m2. Also determine the axial thrust to be provided by springs. Assume uniform wear. (10 marks) 2(b) The upper arm of porter governor are pivoted on the axis of rotation and the lower arms are attached to the sleeve at a distance of 3.78 cm from the axis. The length of the arm and suspension links are 30 cm. the weight of 60 N and the load on the sleeve is 480 N. if the extreme radii of rotation of governor bells are 20 cm and 25 cm, find the corresponding equilibrium speeds. (10 marks) 3(a) A band and block brake, having 14 clocks each of which subtends an angle 15° at the Centre, is applied to a drum of 1m effective diameter. The drum and the flywheel mounted on the same shaft has a mass of 2000 kg and a combined radius of gyration of 500 mm. The two ends of the band are attached to the pins on opposite sides of the brake lever at distances of 30 mm and 120 mm from the fulcrum. If a force of 200 N is applied at a distances of 750 mm from the fulcrum, find: at Maximum braking torque. b) Angular retardation of the drum, and c) Time taken by the system to some to rest from the rated of 360 rpm. (12 marks) 3(b) A governor of Hartnell type has equal balls of mass 3kg, set initially at a radius of 200 mm. The arms of bell crank lever are 110 mm vertically and 150 mm horizontally. 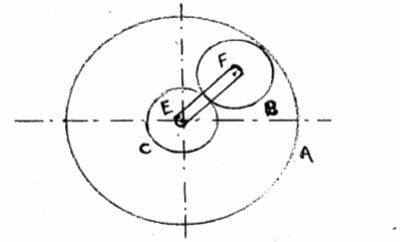 Find a) The initial compressive force on the Spring, if the speed for initiai ball radius of 200 mm is 240 rpm; and b) the stiffness of the spring required to permit a sleeve movement of 4 mm on a fluctuation of 7.5% in engine speed. (8 marks) 4(a) The crank and connecting rod of vertical single cylinder gas engine running at 1800 rpm are 60 mm and 240 mm respectively. The distance of the piston is 80 mm, and, mass of reciprocating part is 1.2 kg. At a point during power stroke when piston has moved 20 mm from top dead center position, the pressure on the piston is 800 kN/m2. Determine I) Net force on the piston Ii) Net ;oad on gudgeon pin iii) the thrust on cylinder walls iv) the speed at which the gudgeon pin load is reverse in direction. (10 marks) 5(a) An epicycles gear train consists of three wheels A, B and C as shown in Fig. 1. Wheel A has 72 internal teeth, C has 32 external teeth. The wheel 8 gears with A and C and is carried. on an arm which rotates about the Centre of A at 18 rpm. If the wheel A is fixed, determine the speed of wheels B and C.